Argentina's Central Bank increases its benchmark interest rate to 60 per cent — the world's highest — in an effort to halt a sharp slide in the value of the peso, which plunged to a record low. Argentina's Central Bank on Thursday increased its benchmark interest rate to 60 per cent — the world's highest — in an effort to halt a sharp slide in the value of the peso, which plunged to a record low. The peso fell more than 13 per cent against the U.S. dollar on Thursday, closing at an all-time low of 39.2 per greenback, after slipping about seven per cent the day before. 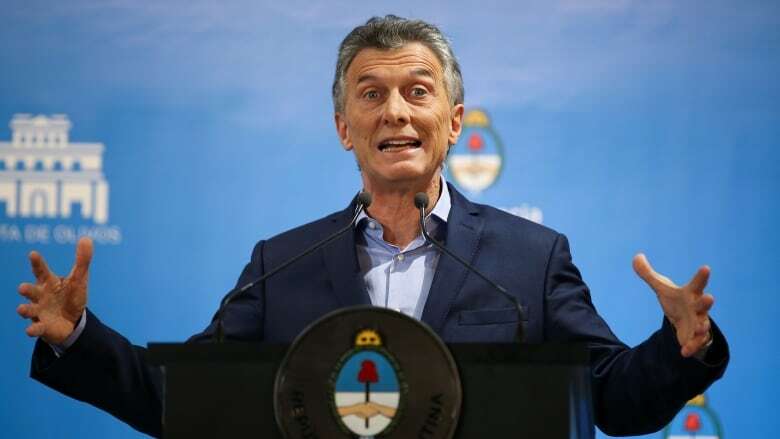 The tumult in the exchange market came a day after President Mauricio Macri said he was asking for an early release of some International Monetary Fund (IMF) funds under an $50 billion US backup financing arrangement approved earlier. "I'm finding it difficult to understand why, after yesterday's announcement about front-loading more of the IMF funding, the government thought the hike was warranted. Hyperactivity starts to look like desperation," she said. Many also have bad memories of the IMF and blame its free-market economic policies for contributing to the country's worst crisis in 2001-02, when one of every five Argentines went unemployed and millions fell into poverty. While journalists filmed screens showing the exchange rates in downtown Buenos Aires, Ruben Montiel, 55, burst out: "Macri is an embarrassment!" "You can't live like this. The prices of everything go up on a daily basis," he said. "There's no work, utility rates have gone through the roof… people are sleeping on the streets." Macri, a pro-business conservative who took office in 2015, had promised to trim Argentina's fiscal deficit, reduce poverty and curb inflation. He cut red tape and tried to reduce the government's budget deficit by ordering layoffs and cutting utility subsidies, but it triggered labour unrest. Meanwhile, the peso's slump against the U.S. dollar lured investors to pull greenbacks out of Argentina. That caused jitters among Argentines, who have been used to stashing away dollars as a cushion since the 2001 crisis, when banks froze deposits and put up sheet-metal barricades as thousands of protesters unsuccessfully tried to withdraw their savings. Dozens died in protests and looting in December 2001 as the economy unravelled and Argentina eventually suffered a record $100 billion debt default. "In the short-term, the government just needs to stop this crisis."